We worked with the factories to provide our customers cutting wheels with highly refined ingredients that provide excellent wheel life, minimal chatter, a fast cut and not contaminate stainless steel. Using a proprietary blend of aluminum oxide grains and zirconia grains, we believe we have achieved this. Our abrasives are not the best in the world, but they are good quality and you won't find a better price/performance ratio from any other company out there. 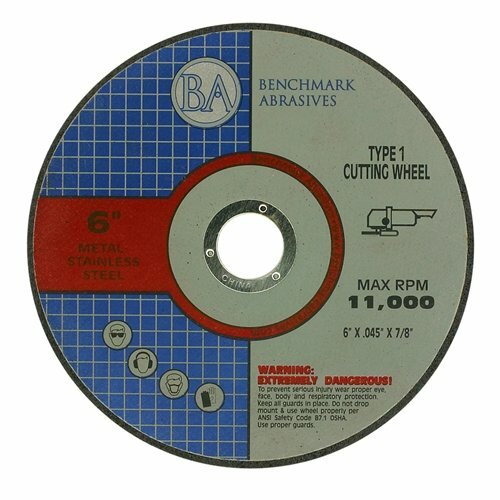 These 6" x .045" metal cutting wheels are ideal for high performance cutting in all types of ferrous metals and stainless steel. They were engineered to last longer and consistently produce the highest quality finish. Used for cutting all ferrous metals!